In the "Teacher Notes" section, it talks about how the "invasion was necessary to allow the opportunity to remove Saddam Hussein" but it fails to mention the lack of United Nations backing for the war. The notes also use the American spelling of "program". A city police chief who led an investigation into charges that Britain cooperated with secret CIA flights to transport terrorism suspects without formal proceedings has been found dead, his deputy said Tuesday. Manchester Chief Constable Michael Todd, 50, was found dead in Snowdonia, about 240 miles northwest of London, Deputy Chief Constable Dave Whatton said. He had been missing since going out for a walk Monday during his day off. TVNL Comment: Just like David Kelly. 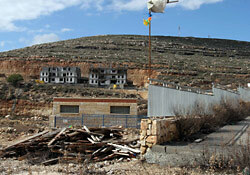 Israel approved plans yesterday to build 330 new homes in a suburban West Bank settlement north of Jerusalem. The move was denounced by the Palestinian Authority as "a slap in the face of the peace process" and called on the Quartet of the United States, European Union, United Nations and Russia to "act to get Israel to revoke the decision". Saeb Erakat, the Palestinians' chief negotiator, said: "This is a provocative action by Israel that demonstrates its intention of further strengthening illegal occupation and colonisation of Palestinian territory." Prime Minister Ehud Olmert has approved the renewed construction of hundreds of an estimated 750 new homes in the West Bank settlement of Givat Ze'ev near Jerusalem, the Housing Ministry said Sunday. TVNL Comment: Israel just keeps building on land that is not theirs and the US continues to give them OUR TAX MONEY!!! Is it any wonder that the Palestinians want to kill Israelites? The Israelis simply take everything they own away. How are the Palestinians supposed to feel? Israel behaves like Nazi Germany and there is no denying it. After failing to anticipate Hamas’s victory over Fatah in the 2006 Palestinian election, the White House cooked up yet another scandalously covert and self-defeating Middle East debacle: part Iran-contra, part Bay of Pigs. With confidential documents, corroborated by outraged former and current U.S. officials, David Rose reveals how President Bush, Condoleezza Rice, and Deputy National-Security Adviser Elliott Abrams backed an armed force under Fatah strongman Muhammad Dahlan, touching off a bloody civil war in Gaza and leaving Hamas stronger than ever. Jewish settler groups are digging an extensive tunnel network under Muslim areas of Jerusalem's Old City while building a ring of settlements around it to bolster their claim to the disputed city in any future peace deal, anti-settlement campaigners have told The Times. One group, the Israeli Committee Against House Demolitions, said that settler tunnels could one day extend under the al-Aqsa mosque, Islam's third-holiest site, and claimed that extremists could use the access route to attack the structure in an attempt to prevent the creation of a Palestinian state. Settler groups flatly deny such allegations. TVNL Comment: If Muslims had done this tunnel how do you think the US media would cover it? How do you think FOX News would cover it? As it is the US broadcast media is not covering it at all! More than six years after the U.S. invaded to establish a stable central regime in Afghanistan, the Kabul government under President Hamid Karzai controls just 30 percent of the country, the top U.S. intelligence official said Wednesday.